Are you unsure how generate more traffic to your blog? Do you feel overwhelmed by all the SEO articles out there (or not even sure what the term means)? Do you wish someone could break it down for you in simple steps? 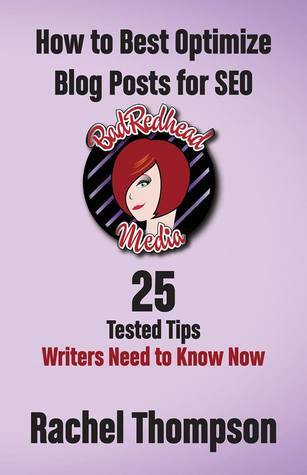 Rachel provides you her top 25 tips laid out in easy to understand language gleaned from her own ten years of successful blogging as well as optimizing and managing countless client blogs. Containing a wealth of information, these tips will help you increase traffic to your site! If SEO confuses you, this is a great beginner breakdown for any new blogger, writer, veteran author, and even small businesses. Buy your copy NOW and start increasing your visibility! In my ongoing efforts to learn about how to make this a better blog, I decided to tackle some beginner SEO. It's a topic that can be totally terrifying if you have no idea what SEO is or how to figure it out. I happened to see this author in a webinar and decided to check out her books. Imagine my delight when I found this for only 99c! Rachel writes as if you're sitting down with her at a table and walking you through everything, step by step. She links to quite a few handy (and free) tools to help you with improving on whatever SEO you currently have going. As if that isn't enough, all of her tips are specific so you're not spending hours trying to nail down generic information to something that you can use. This book is very specifically for those using Wordpress. If that isn't your platform (and my site actually isn't), then you'll have to do some tweaking to make it work for you. Some things may not be possible to do but I've already found some that I can put into place. Also, the section of the book that actually pertains to this topic is only about 44% on Kindle with the rest going to an author bio and a sneak peek at her next book. For 99c, you honestly cannot go wrong with this book. If only one of the 24 tips (the 25th is more of yay, you made it!) is something that you can apply to your blog, it's more than paid for itself. I know that this is one that I'm going to keep coming back to so I can continue to add to what I'm already doing.